Our noble quest to get over the anti-Trekkie prejudice which runs deep in our veins continues. 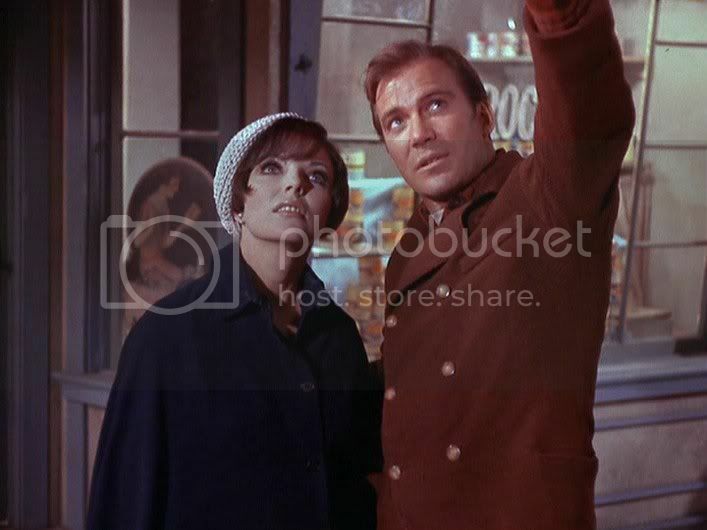 Today, we went for the much-acclaimed classic episode, The City on the Edge of Forever. Written by the well-known (apparently!) sci-fi writer, Harlan Ellison, and later winning a Hugo Award (the mother of all sci-fi awards), The City on the Edge of Forever is a tightly-wound story about drugs, time travel and moral dilemmas. Oh, Leonard. You're so silly. Now properly batshit insane, McCoy screams garbled phrases, runs around, and then beams himself down onto the nearest planet. 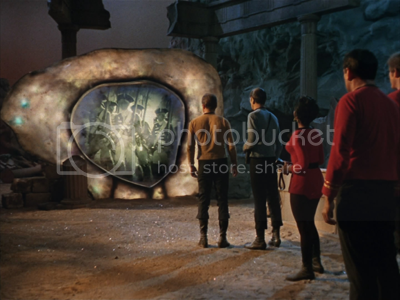 When the rescue team - Captain Kirk (William Shatner) and Mr. Spockfield Spockly Spock the Third (Leonard Nimoy) among them - go chasing after him, they find a mysterious portal. This portal may seem like glitter-encrusted plastic to our space adventurers, but soon the Man in the Portal Voice assures them that it is, in fact, a time-travel device. Just when Spock and Kirk are busy marveling at its time-travel-ness, crazy McCoy jumps in - and manages to alter the course of history in such a way that suddenly the Enterprise disappears from space above them. Now Kirk and Spock have to follow him. BEHOLD! LUMPY DOOR OF TIME-TRAVEL-NESS! They do; and land in Depression-era USA. After some comical mishaps with their sci-fi uniforms and Spock's pointy Vulcan ears, they end up in the warm and friendly care of do-gooder, Edith Keeler (Joan Collins(! )), at her 15th Street Mission. 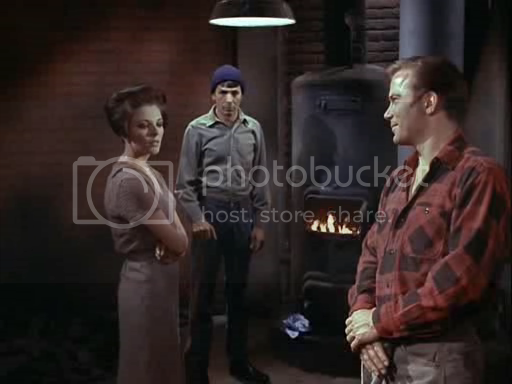 While Spock busies himself with "endeavoring, ma'am, to construct a mnemonic memory circuit using stone knives and bear skins," Kirk falls in love with Edith - hard. The mystery of McCoy remains: where is McCoy? What does he do which alters the space-time continuum so dramatically? How can they stop him? They do, eventually, figure it all out - and it unearths a hairy moral tangle of surprising (for 1960s television) complexity. Oh, Mr. Kirk. Always so ready to give your heart out. The time-travel paradox thriller is, by now, a well-worn sci-fi theme (e.g. Back to the Future, The Terminator, Bring the Jubilee). What makes this Star Trek episode understandably a classic is its variation on the theme: what if straightening things out in the past is morally difficult? Even morally repugnant? This episode's philosophical maturity is admirable, in that it investigates the ambiguity of real life, rather than falling back onto the standard "he good, he bad" schoolchild moral dichotomy. KIRK: Couldn't you build some form of computer aid here? SPOCK: In this zinc-plated, vacuum-tubed culture? KIRK: Yes, well, it would pose an extremely complex problem in logic, Mister Spock. Excuse me. I sometimes expect too much of you. Leonard Nimoy's expression is priceless! McCOY: Oh, I'd give a lot to see the hospital. Probably... needles and... sutures. All the pain. They used to hand-cut and sew people like garments. Needles and sutures... all the terrible pain! 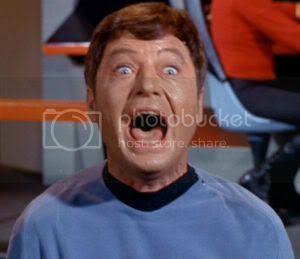 Oh, poor, pessimistic humanist Dr. McCoy. He's like Hawkeye Pierce. Only angrier. So, after all this talk, you might think we looooved this episode? Alas, no. While we admired these things in a detached way, our emotional core still couldn't see anything but plastic, glitter, tight pants, bad acting (Mr. Kelley being particularly bad) and strong vibes of Nerd. Is the prejudice bigger than us? Bigger than logic? Possible. The prejudice made us notice, for example, glaring points which were never resolved: what happened to the guy who beamed himself? (Or did he phase himself?) Who are McCoy's "murderers" after all? Why is everyone's uniform so tight? Did Uhura forget to wear her pants today? Why 1929 America, of all the places in the entire history of the world? Etcetera. If you like Star Trek, you've probably already seen this. If you haven't, you'll definitely love it. If you hate Star Trek, you'll probably admire this but it won't be converting you anytime soon. And if you're curious, or think the PPCC is far too skewed a reviewer, you can now watch the episode online! I remember recommending this to you guys. Great to see it reviewed. Ramneek - And thanks for the rec! And keep recommending things! This stuff is great.